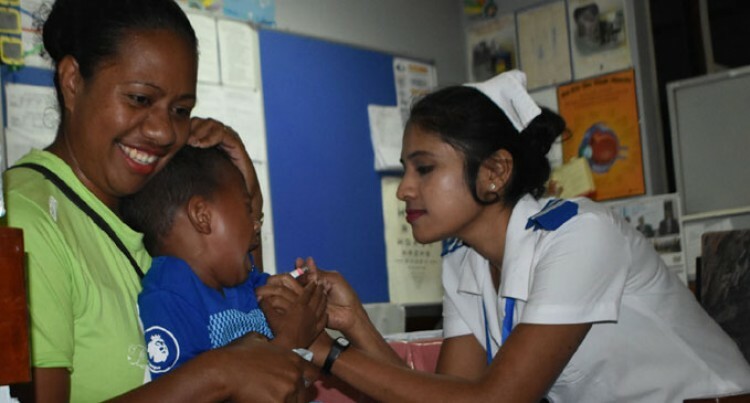 Asilika Batilekaleka was among happy parents after her four-year-old son received the meningococcal vaccination at Ro Qomate Health Centre in Labasa yesterday. Ministry of Health and Medical Services are providing free vaccination for children below the age of 19. The country-wide mass vaccination campaign aims to vaccinate up to 325,000 children and adolescents against the deadly disease. The campaign follows the declaration of an outbreak of the meningococcal disease in late March, by the Ministry of Health and Medical Services. Mrs Batilekaleka said she was glad her son was vaccinated because it was a relief knowing he would be safe. She has been advising her children to be extra vigilant with what they ate and drank when they were away from home. “I was scared of even sending them to school because I was worried they might get infected,” Mrs Batilekaleka said. “What worries us parents is how fast this deadly virus can kill someone who is infected. “I am so happy that my son is vaccinated. It’s a relief. “A child in the village had the disease and I saw the pain the child went through. I was scared because I thought of my own son. “As a parent I’m so grateful to the Government and Ministry of Health for taking out time to look at the needs of the school,” she said. Meningococcal disease is a life-threatening disease, which usually causes meningitis, inflammation of the lining of the brain and spinal cord and septicaemia or blood poisoning. The Ministry of Health and Medical Services has confirmed there were 58 reported cases of meningococcal from January 1 to April 22 this year. Two were from the Northern Division.